Who Are the Middle Class? As we wrote in a May 2018 paper, there are many “correct” ways to define the middle class. The key is for the definition to be sufficiently precise and consistent to allow researchers to accurately measure progress, as well as to develop and assess policy. Our definition is a relative one, meaning that the thresholds pictured above will shift as the income distribution changes shape. If income rises across the distribution, so too will the thresholds that delimit middle-class incomes. Defining income classes according to percentiles of the income distribution also means that the middle class cannot grow or shrink: it will always contain exactly 60 percent of American households. For us, this is a feature rather than a bug. For one thing, a relative definition allows for sensible comparisons across time and place. For instance, we are able to evaluate changes in the share of income or wealth going to the middle class independently of changes in the share of households in the middle class. Of course, there is a considerable distance between a household with an income of $40,000 and one with $140,000. As it happens, this broad range is close to the proportion of Americans who consider themselves to be middle class. But with a reasonably broad definition, we will need to pay particular attention to the differences within the wider group. While the middle 60 percent is our “default” definition, there will be occasions when we adopt a different one, due either to data constraints or to particular research questions. We may look at the middle 60 percent of the distribution within a particular metro, for example; or at the middle three quintiles of earnings, rather than income, in a study of wage trends. We may use different datasets for different purposes, which will change the quintile thresholds. It would not be sensible to slavishly adopt one narrow definition, and it would be foolish to promise as much. But we do promise to be clear, always, about which definition, and which dataset, we are using, and why. The income thresholds referenced on this page identify the middle class on a national distribution of household income before means-tested transfers and federal taxes, using data from the Congressional Budget Office. The CBO combines data from the Statistics of Income, a nationally representative sample of individual income tax returns collected by the Internal Revenue Service, with data from the Annual Social and Economic Supplement of the Current Population Survey. The CBO publishes data on income both before and after taxes and transfers. Income before transfers and taxes includes market income plus social insurance benefits. Market income includes labor, business, and capital income, plus income from other sources (for instance, retirement income), as well as employer-paid health insurance premiums and the employer’s share of Social Security, Medicare, and federal unemployment insurance payroll taxes, which are counted as labor income. Social insurance benefits involve benefits from Social Security, Medicare, unemployment insurance, and worker’s compensation. The CBO’s measure of income after transfers and taxes adds to this measure both in-kind and cash benefits, as well as individual income liabilities and payroll, corporate income, and excise taxes. Elsewhere, we have used data directly from the Current Population Survey to define the middle class. The CPS allows us to investigate the distribution of income in more finite terms than the quintile-level statistics published by the CBO, but CBO data capture a more complete picture of household income. The primary measure of income in the CPS, household money income, includes self-reported income earned by all household members before taxes. In addition to income from wages or salary, this includes self-employment income, Social Security and pension payments, cash transfers, alimony, child support, and income from interest, dividends, estates, or trusts. It excludes capital gains and non-cash transfers like food stamps. 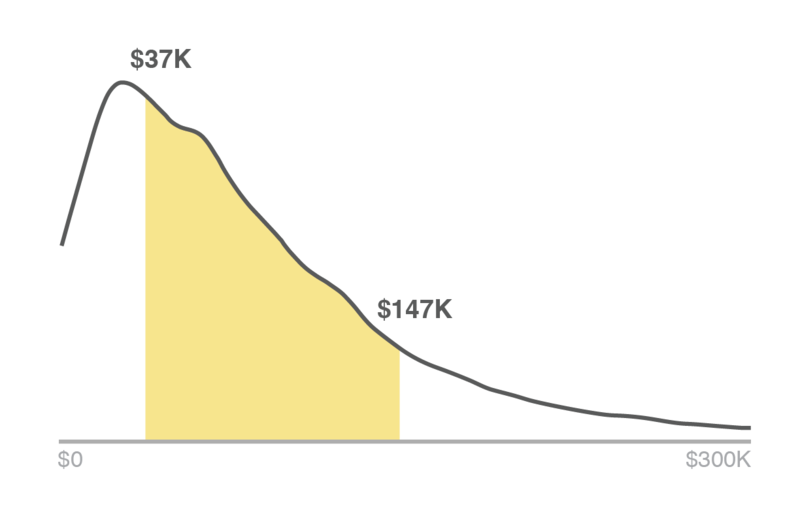 Income is adjusted for household size to reflect that, for example, a single person living off of $50,000 is better off materially than a four-person household with the same income. In longitudinal studies, this adjustment also helps to reflect that declining household sizes have eased the pressure on the average household’s budget. In general, we use a square root equivalence scale to adjust for household size. This means that we divide income by the square root of the number of people in the household, which allows for “economies of scale” in household consumption. The CBO uses this equivalence scale to rank households on . We often choose to express income in household-of-three equivalents because this is close to the average U.S. household size of 2.5 people. In practice, this means multiplying size-adjusted income by the square root of three. The Initiative’s definition of the middle class is based on a national distribution of income that does not adjust for geographic variation in the cost of living. However, depending on the purpose of the work, researchers associated with the Initiative may sometimes identify the middle class on a local distribution, or adjust income by regional price parities.